These tanks are ideal for small batching, fermentation, storage and transferring product. Almost always in stock. Shipped via UPS Freight®. Discounted pricing available for qualified customers. Quantity discounts available. Four (4) leg positioners/lifting lugs on the top of the tank for lifting and stacking 550 gallon tanks and smaller on top of each other (up to three high, full or empty). Tanks larger than 650 gallons cannot be stacked nor moved when full. Please review this drawing carefully. Your equipment will be supplied exactly as drawn. You will digitally sign and accept this Approval Drawing during the checkout process. You must be logged in to view the Approval Drawing. Log in or Register for a new account here. Before completing Checkout, this Approval Drawing and a Terms document will be digitally signed. You DO NOT need to print the document. Instead, you will digitally sign online. You may use any computer or device, including the one you are using right now. A touchscreen, such as a smartphone or tablet, might be easier than a mouse for drawing your signature on the screen. There is an option to type, instead of draw, your signature. Price and delivery refer to the product as described. Please note, all fabricated equipment (such as tanks and vessels) are of existing design. 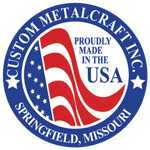 Once your order is placed, any changes, including design, fittings, material finish, lids, vents, caps, or other parts, will incur processing times, change costs, delivery times, etc. per market conditions and production capacity. Although we will work hard to meet your needs, delivery times of 8-12 weeks or greater are possible for changes requested after the order.